Have you ever had Homemade Limoncello? If you haven’t, you’re really in for a treat. Where did this inspiration for homemade limoncello come from? I happened to see a show where Giada De Laurentiis was showcasing her recipe. Off I went to do some research. Limoncello is a uniquely Italian lemon liqueur, the second most popular liqueur in Italy. The reason Limoncello is so popular is because it imparts a wonderful lemon flavor without the sourness that is associated with pure lemon juice. To make homemade limoncello in the traditional Italian way, you would use Sorrento lemons, a neutral grain spirit, and simple syrup. Its origins are a matter of debate, mostly based on myth and folklore. Its roots go back many centuries, mainly associated with the Amalfi coast. Some historians believe fishermen drank limoncello to ward off medieval maladies. Others believe Italian monks created it in their monasteries for medicinal purposes. Lastly, it is thought wealthy Amalfi families possibly invented homemade limoncello for their own pleasure as late as the early 1900s. 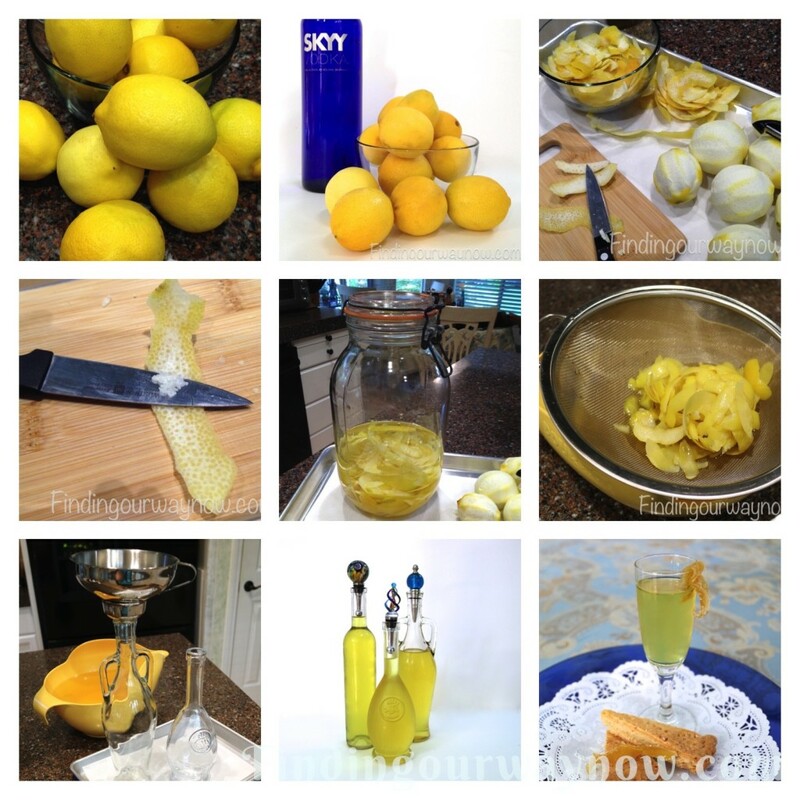 However limoncello came to be, it is a delightful liqueur that is very easy to make. From my research, and with Giada’s recipe as my inspiration, this is the recipe I used to make my own homemade limoncello. 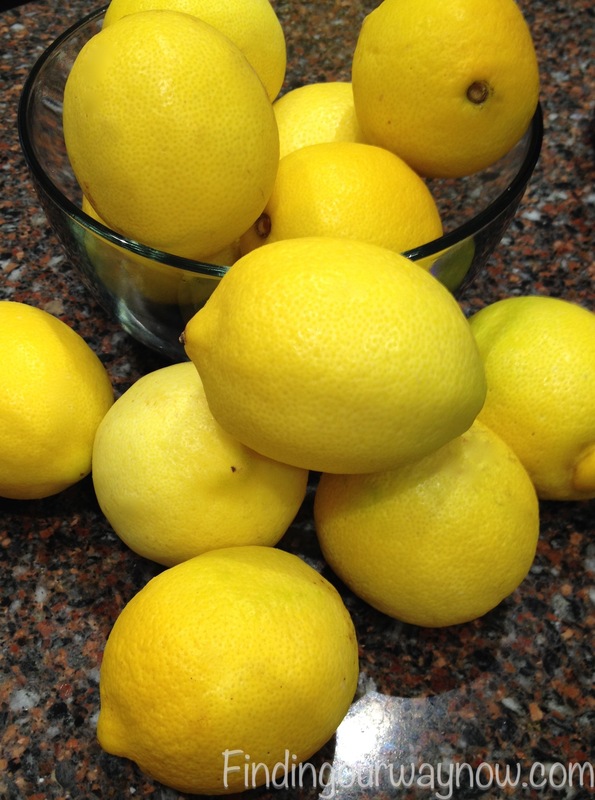 Wash the lemons thoroughly to remove any residue. Peel the lemons in long strips using a vegetable peeler. Using a small sharp paring knife, carefully trim away the white pith from the lemon peels and discard. You should have 2 cups of prepared peels. Place the prepared lemon peels in a 2-quart latch down lidded jar. Pour the vodka over the peels and cover. Place the jar in a cool dark place. Steep the lemon peels in the vodka at room temperature for at least 5 days. On the 5th day, combine the water and sugar in a large saucepan over medium heat and stir. Make sure the sugar is completely dissolved. Bring to a boil then remove from the heat, letting the syrup cool to room temperature (75° F). Pour the cooled syrup over the vodka and peel mixture. Close the lid and let the mixture stand at room temperature in a cool dark place for 24 hours. After 24 hours, strain the limoncello through a fine metal strainer, reserving the lemon peels for later use. 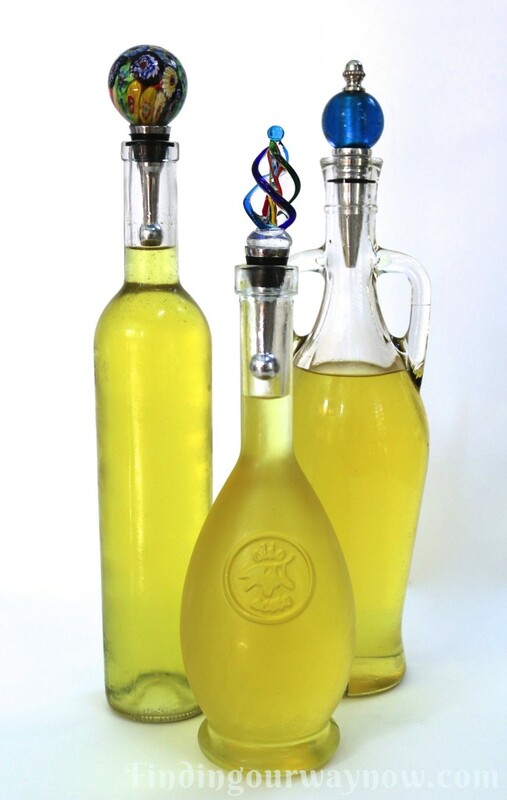 Using a funnel, decant the limoncello into decorative bottles. Cork and seal the bottles. Refrigerate the homemade limoncello overnight or up to a month or two, or you can freeze it up to a year… if it lasts that long. Notes: Cleaning the lemons prior to peeling is very important; this will prevent the potential tainting of the final product. It’s not required, but I do keep the leftover peeled lemons in a plastic bag for another use. I’ll often juice the leftover lemons and freeze the juice in ice cube trays for later use. In the steeping process, most of the lemon flavor is extracted from the peels into the alcohol in the first few days. I find that 5 days achieves a good balance. You can let it go for longer, up to a month or two, for a stronger, bolder flavor. The amount of time you choose to steep the lemon peels is a matter of taste. Do not skip the part about cooling the simple syrup. This will ensure a clear finished product. The amount of simple syrup you use is also to your taste. If you prefer the final product to be less sweet, reduce the amount of simple syrup you pour into the infused vodka. You can play with the ratios of the infused alcohol to simple syrup by as much as 4 cups. Just be mindful that the more syrup you use, the more you will dilute the alcohol, making it a smoother-sipping liqueur with less alcohol. As for me, I prefer it to be in the middle. A top-shelf Vodka isn’t necessary; a smooth medium quality vodka works nicely. The fresher the mint the better for the best most aromatic flavor. I’ll also attach a sticker to the jar of steeping lemon peels and vodka with the date and time I’m to go on to the next step to make and add the simple syrup. I’ll also add a label, with the date and time the finished product was decanted and stored in decorative bottles. I love anything lemon, so the Homemade Limoncello is one of those things we will always have around. 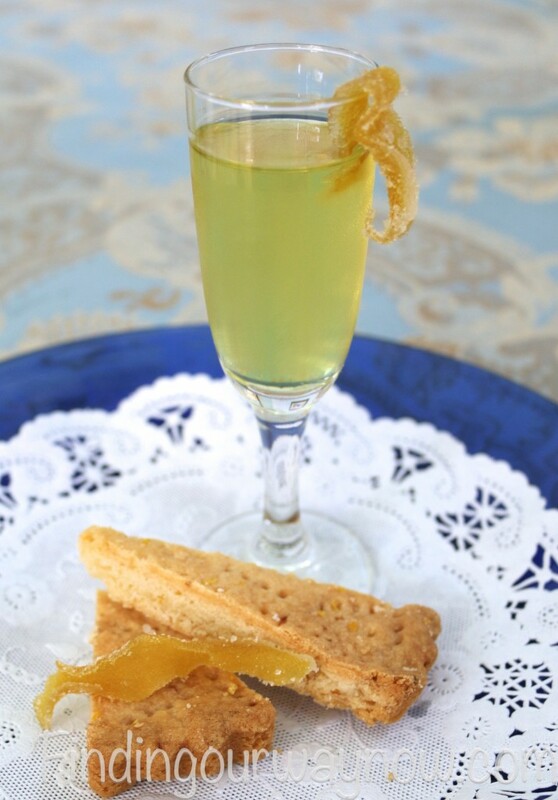 When you add a bit of candied lemon peel and lemon shortbread cookies to the mix, you have a delightfully refreshing treat, one any guest would enjoy. P.S. : Keep an eye out for other recipes made from the limoncello recipe leftovers. They are just as lemony and fun. If you enjoyed “Homemade Limoncello,” check out Lemon Meringue Pies In A Jar, Lemon Sangria, and Smashed Lemon Potatoes.